While many kids have had the joy of discovering the fire-starting properties of magnifying glasses in sunlight, they rarely get past the point of burning holes in random leaves (if they have the patience to get even that far). 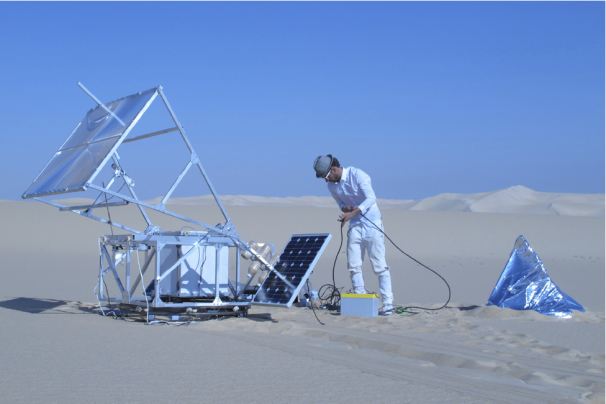 Markus Kayser, however, incorporated the principle into two low-tech renditions of high-tech fab lab residents: the laser cutter and the selective laser sintering 3D printer. A mix of artistic commentary and clever engineering, the Sun Cutter and Solar Sinter might not be as versatile as their lab-dwelling counterparts, but they need much less in the way of infrastructure for support. The Sun Cutter focuses sunlight using a fixed ball lens, while cams on a solar-power-driven timing belt control the motion of a platform on which the raw material sits. The current incarnation of the Sun Cutter can cut paper, card, and plywood up to 0.4mm thick, and cuts out the frames of a cute, clever pair of sunglasses. How’s that for meta? Meanwhile, the Solar Sinter uses a different--and more easily acquired--feeder material than most other selective laser sintering (SLS) printers. Instead of powdered resins, plastic, or metals, the environmentally friendly 3D printer uses sand, plain old silica. Light collected from about two square meters of Fresnel lenses heats the sand above its melting point (1500 degrees C); once it cools, it solidifies into a solid chunk of glass. Kayser himself acts as the material dispenser, smoothing layer after layer of sand onto the melting platform. The final product isn’t as finely-resolved as one built using an SLS printer, but on the other hand, you’d be hard-pressed to run an SLS printer in the Sahara desert.